Stefanie Martinez is available. Raised in Tennessee, Stefanie now lives in Paducah and anchors mornings. 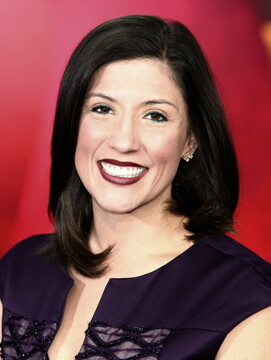 She’s an experienced and energetic anchor who connects with viewers on air and out in the community. Please consider her. See all of Stefanie's clips. WPSD-TV, Paducah: Morning Anchor / Live Reporter (May 2016 - present). Anchor in studio two to three days a week and serve as live field reporter on days when not in studio. Turn a story for later newscasts when not anchoring. Write, produce and front weekly medical report, ‘What’s Going Around’. Constant interaction with viewers via social media. Team player and multi-tasker. WNWO-TV, Toledo: Producer, Anchor, Host, Reporter (October 2014 – January 2016). Solo anchored a two-hour morning show. Booked and interviewed two guests daily. Worked with management to create a thirty-minute Midday newscast. Served as producer, editor and solo anchor. Fill-in Host for "Better Living". Constant tweets and posts to Facebook. WFXL-TV, Albany, GA: Main Anchor/Producer (March 2014 – September 2014). Produced, wrote and solo anchored nightly 10pm news. Promoted by Sinclair Broadcasting to their Toledo affiliate after just six months. Saint Anejo (restaurant), Nashville: Server (October 2013 - March 2014). Carrabba's Italian Grill, Nashville: Head Server, Bartender (March 2012 - September 2013). WTVW-TV, Evansville: Anchor/Co-Host/Producer/Reporter (March 2011 - March 2012). WXVT-TV, Greenville, MS: 10pm Co-Anchor/Producer/Reporter (March 2008 – July 2010). Middle Tennessee State University, Murfreesboro, TN: Bachelor of Science, Electronic Media Communication with an Emphasis in Broadcast Journalism. Minor: Political Science. Connecticut School of Broadcasting, Nashville: Certificate of Completion. INews, Avid, ENPS, Linear and Non-linear Editing. Adobe Premiere Pro, Illustrator and InDesign. Board member, Salvation Army and American Red Cross. Committee member, American Cancer Society’s Relay for Life and Dancing With Our Stars. Member, Charity League of Paducah. Volunteer, Reading Pals. Perry Boxx (current supervisor), News Director, WPSD-TV, Paducah, 618-658-0396. Kayla Dixon, 5pm Producer, WPSD-TV, Paducah, 716-550-3283. Nick Miller (current supervisor), Editing Manager, WPSD-TV, Paducah, 270-705-2641.